What can I do with my Parent Account? A Parent account is needed to access the Parent Dashboard. The Parent Dashboard is a hub for you as a parent to be able to oversee your child's settings and interactions in the game. 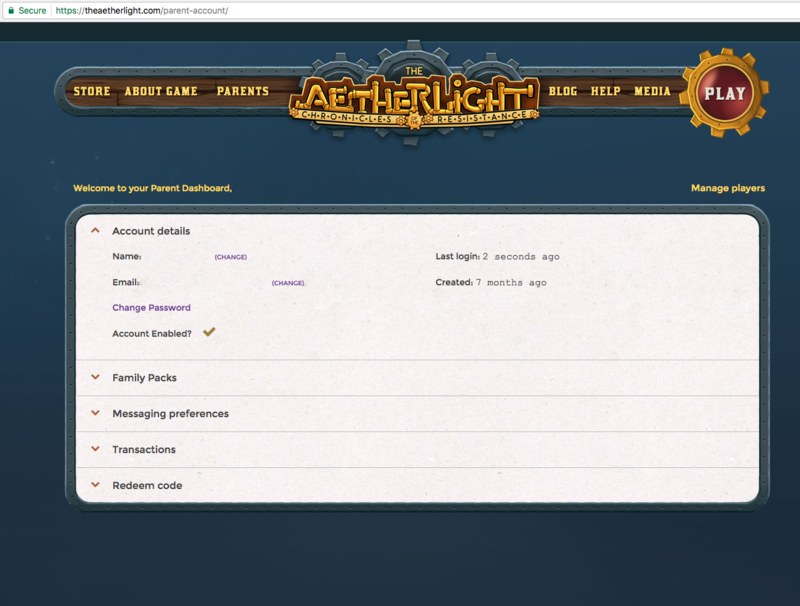 If your child already has an Aetherlight account, choose "Associate Existing Player" and then enter the login details for your child's account. If your child does not yet play The Aetherlight, choose "Create New Player." 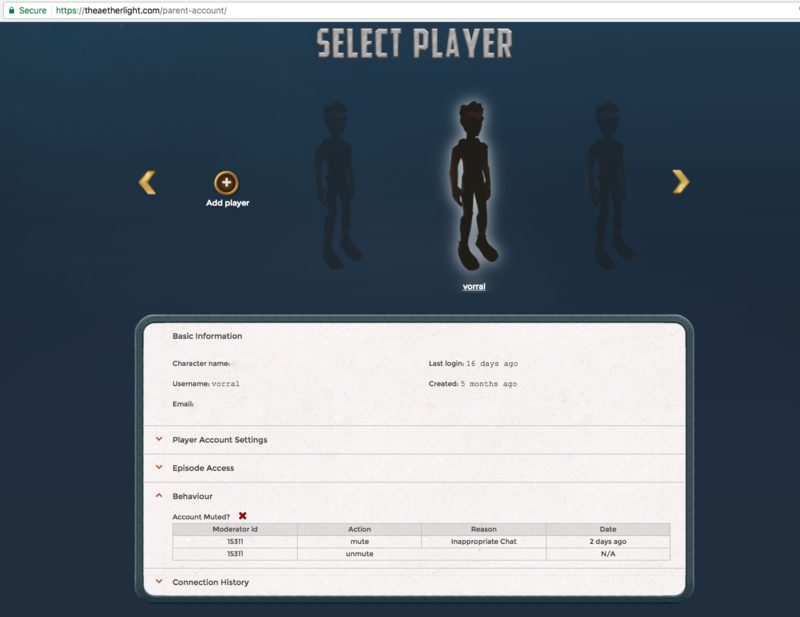 This will allow you to set up a player for your child, which they can customize when they first start playing. 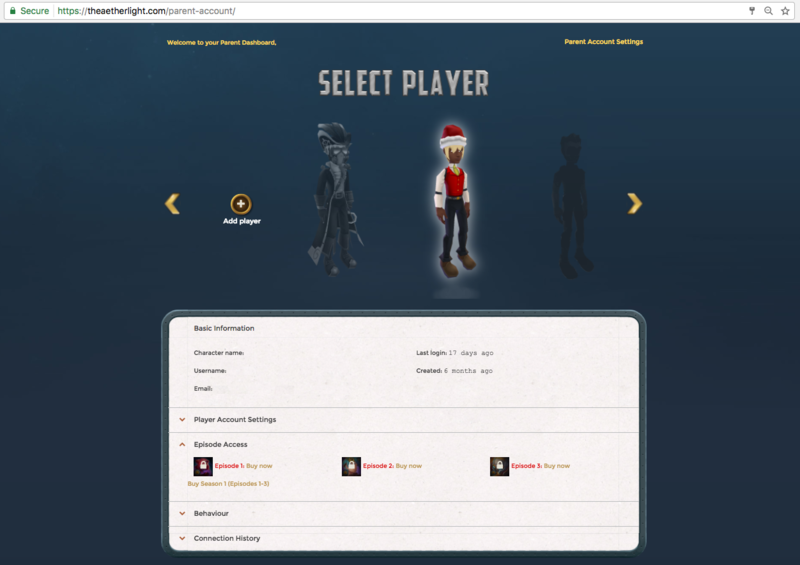 Once you have successfully associated users with your account, you can click on their character and then modify the settings for that player. Those settings include enabling and disabling the account and chat as well as resetting that accounts password. You can also receive email updates on your child's progress through the game to help you engage with them about their time in-game. You can purchase Episodes directly from the Parent Dashboard, as well as see what Episodes a player has access to. To do this, choose a character and then open the "Episode Access" section. You can see any Family packs you have purchased by toggling the "Parent Account Settings" in the top right. To purchase single Episodes for an account, click on "Manage Players" then on the character you wish to give the Episode access to. Next, open the "Episode Access" section. From here you can purchase individual Episodes by choosing "Buy Now." Alternatively, you can purchase the Family Pack of each Episode which can be done by going to your "Parent Account Settings" and clicking "Family Packs". From there, you can choose which Episode you would like to unlock for all your associated accounts. We have a full-time moderation team to keep players safe within The Aetherlight. Sometimes, this means that we have to send a user a warning, temporarily mute their chat, or (in some cases) suspend or even ban the user from the game. As a Parent, you can be actively involved in this by using the "Behaviour" section on the dashboard. Here, you can see if your child has received any moderation actions, and what the reason was. The Parent dashboard allows you to modify your name, email, and password. To do this, choose "Parent Account Settings" from the top right. Under 'Account Details' you have the ability to change these fields by clicking the purple "change" link. What is the difference between a Parent account and a Player account? How do I create a Parent Account and log in to it? How do I play/make an account? What is a Family Pack and how does it work?